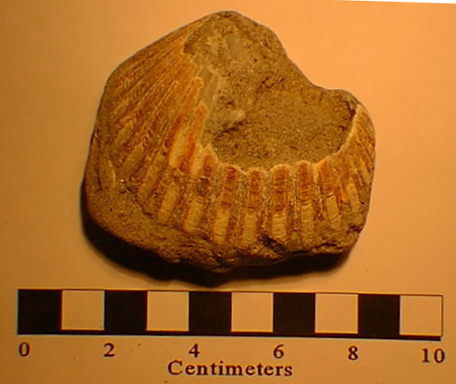 This web page is a short collection of images of fossils collected from Rockaway Beach (Queens, NY), Staten Island, and Sandy Hook (NJ). The conclusion that some of these items are actually of antiquity is purely subjective. Taphonomy is the study of how (and why) fossils are preserved. Modern geologic processes can take practically any bone or shell material and give it a "fossil" appearance. 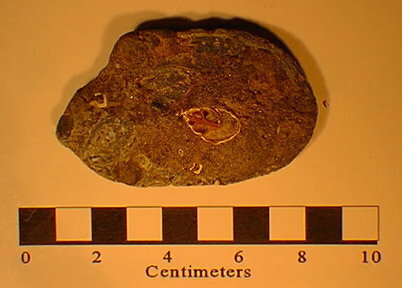 For instance, modern shells commonly become attached to iron debris (shipwrecks, bottle tops, etc.) as seawater reacts with the iron to form rust. In addition, shell accumulations in the highest tidal range are subjected to frequent wetting and drying by rain or highest tides. 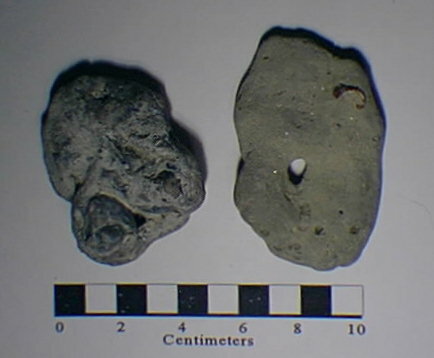 This infrequent wetting of shell material causes calcite and aragonite to dissolve and then precipitate as microcrystalline calcite cement upon drying. These processes that cement modern shell material are essentially the same processes that helped to preserve shells and organic remains as fossils in the geologic past. Several additional important geologic processes related to fossils should also be noted. First, vertebrate bones and teeth consist of porous apatite (a calcium phospate mineral). When exposed to seawater minerals precipitate within pores and ion substitution replaces some of the spaces within the aragonite mineral lattice. The net result is that bone material tends to become darker in color, harder, and more brittle with time (if it isn't eaten or dissolved in organic acids in the sediment first!). Another important process is the formation of concretions. 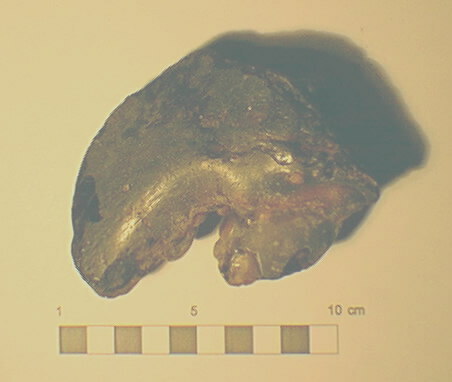 Concretions are nodules that commonly form around dead organisms or shell material. They form as layers of minerals (usually calcite, siderite, hematite, or phosphorite) accumulate around an organism buried in shallow sediment. Concretions can preserve delicate features, including structures that do not consist of shell or bone, such as crab carapaces. Many different geochemical processes can lead to the formation of concretions. One way this happens is as an organism slowly decays it releases ammonia which reacts with sea water in the sediment to precipitate minerals. Most fossils illustrated below are probably Holocene or Pleistocene in age (several thousand to about two million years old). Definitively older ages are noted where possible. The companion Modern Sea Shore Creatures of the New York Bight web page provides many images of invertebrates that have fossil relatives or close analogs. Where possible this is noted in the caption text. 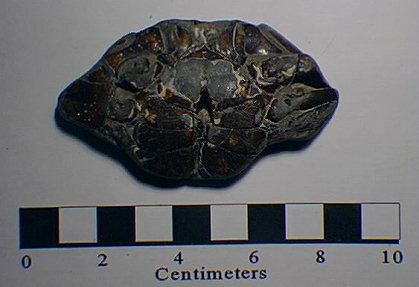 Blue crab (ventral view) preserved in concretion matrix. Various crabs and parts (all ancestors of modern blue crabs). The giant claw of an American Lobster. This one probably would have tipped the scales at around 8 pounds when alive! 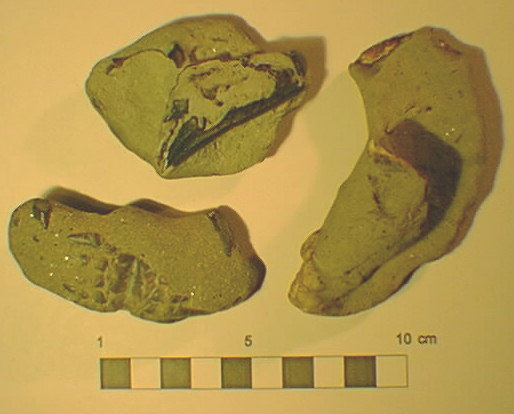 Concretion material bearing barnacles (Balanus sp.) and gastropod fragments. 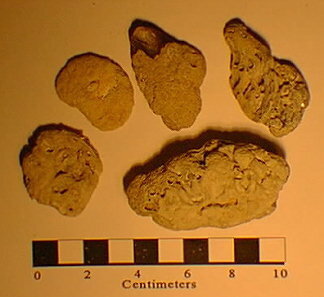 Calcareous sponges (These specimens are call "crumb of bread sponges." The are found living on hard bottom surfaces and on shipwrecks. 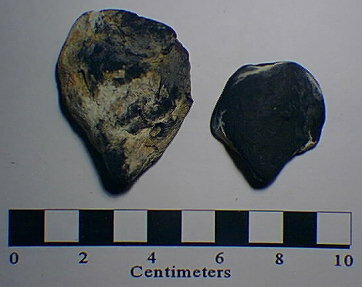 Both recent and ancient examples can be found on area beaches; fossil examples tend to be dark and densely cemented). 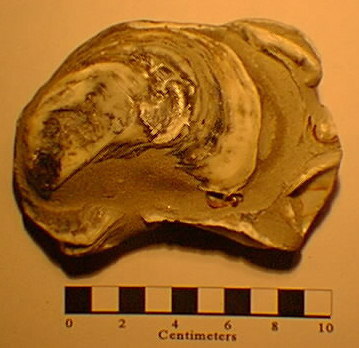 Fossil oysters in concretion matrix. Cast of shells preserved in coal-like shale. Cast of shells preserved in coal-like shale (reverse side). Gastropod (in cross-section) encased in beachrock matrix. 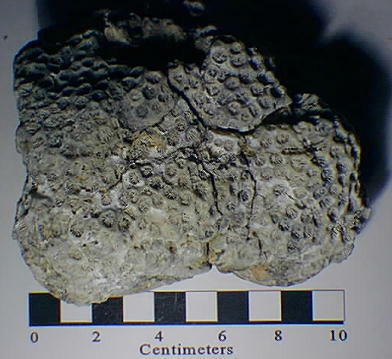 Coral encrusting a concretion (possibly modern a modern specimen; fossil coral tends to be denser and capable of retaining a polished surface). Before this century fishermen reported that "coral reefs" existed in the NY Bight. One such reef, the Shrewsbury Reef, offshore form Seabright, NJ was one such reef where an abundance of encrusting coral on submerged rocky outcrops probably had a similar appearance to more tropical reefs. 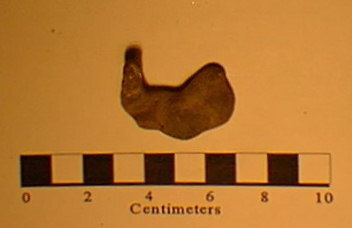 Earbone of an swimming mammal, probably a small whale. 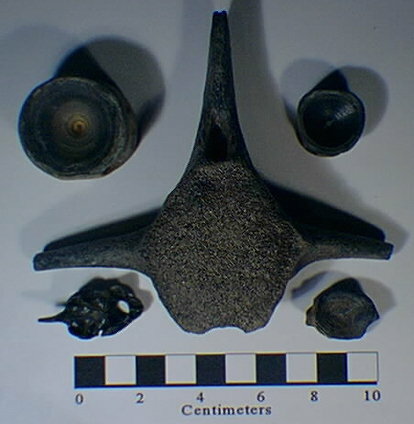 Large fish and mammal vertebrae. Modern bone can turn black fairly quickly. 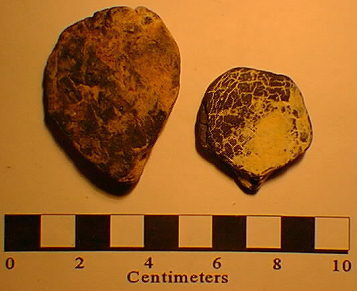 Material displaying butcher marks are common and are probably from offshore dumpsites (originally discarded as cellar ash. Some display scratching typical of primative tool cutting. These may have been derived from indian settlements that are now offshore. 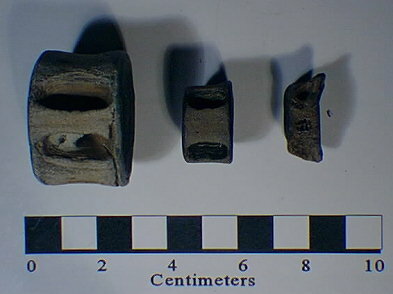 Shark vertebrae (showing side views of three of the vertebrae above). 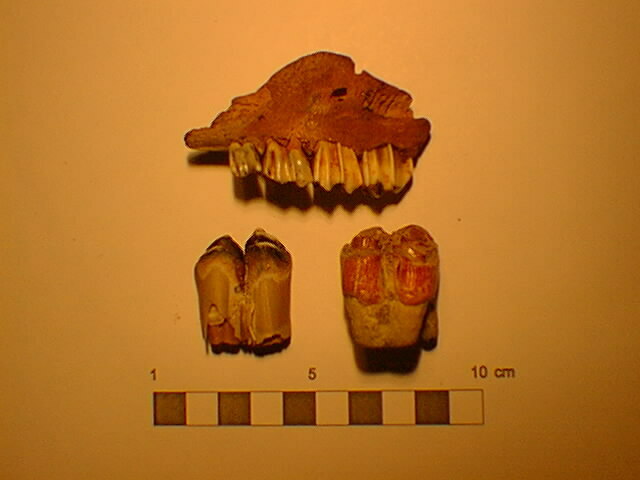 Teeth from land vertebrates (possum, deer, and horse), probably recent. 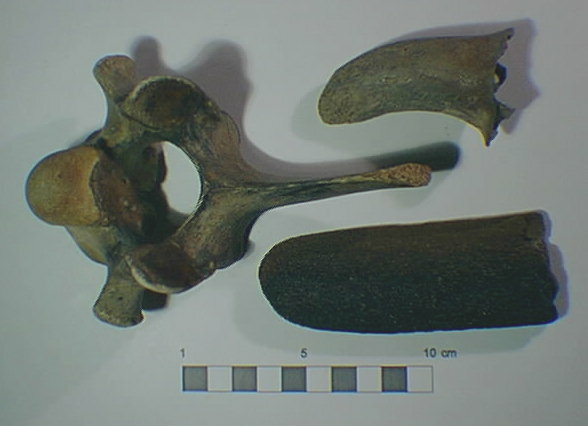 Sea mammal bone: a sea lion claw and vertebrae, a rib bone from a small whale... Although scarce, these creature do visit the NY harbor area on occasion. For more information about NY Bight area fossils look at the Bibliography.